So family and friends will be visiting this week, and meal time is pretty easy, but what to do with the rest of the time you will be together? 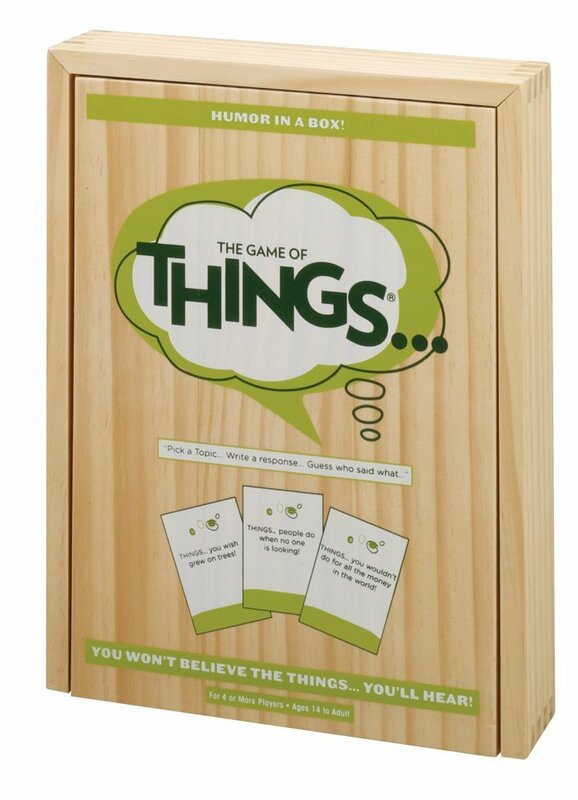 Instead of turning on the tube this holiday season why not try some good’ole fashioned party games? Sure there are your traditional board games like Monopoly and Settlers of Catan as of recent years. But not everybody is into throwing dice in a competitive battle of pure luck. From a board game fanatic, here are a few games that pretty much anyone can enjoy. This is the pest control guy’s list of Top 10 Games to play with your Holiday group this year. #1 – What Were You Thinking? Name 5 people you will say “Thank You” to today. This is by far the best version of charades you will ever play. Best for groups of 8 or more. Divide into two teams. Send one team into another room. Each team will now write down these 3 things: Person, Thing, Action. Now the two teams will come back together. Each team will now pick 3 people to act out the charades and 1 person to guess. Two of the actors and the one guesser will need to all leave the room. The words will now be revealed to the first charades player. One of the actors will be called back into the room. The player with the revealed words will then act out each word/category separately for the next charades actor. After each word has been acted out without speaking of sounds for the 2nd actor. The 3rd actor will be called in and the 2nd will repeat the process of acting out for the 3rd. Finally they guesser is to be brought in and the guesser will need to guess each of the 3 words. 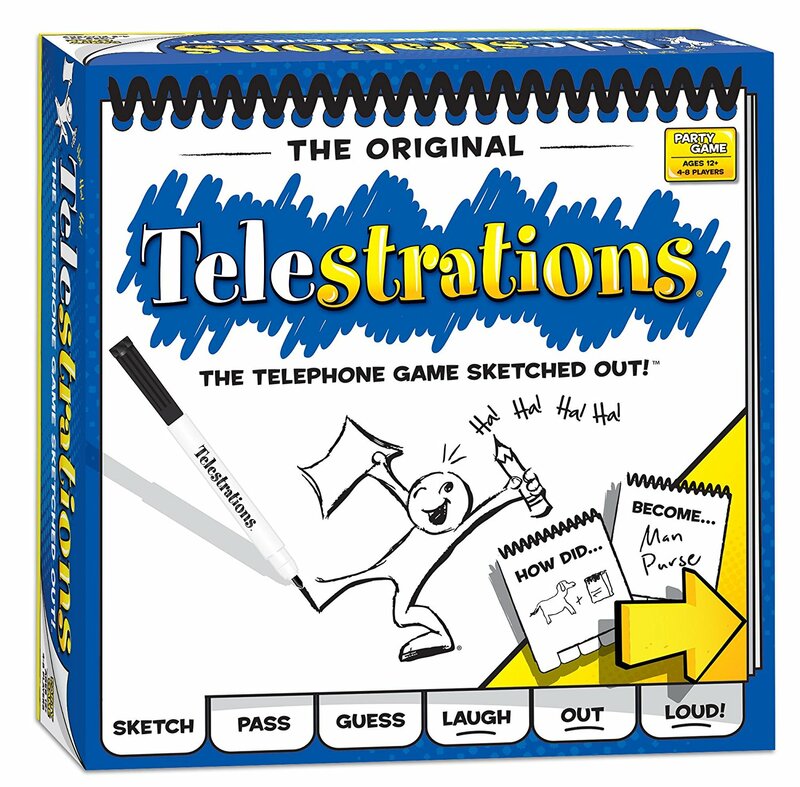 Essentially the game is telephone charades in 3 stages. 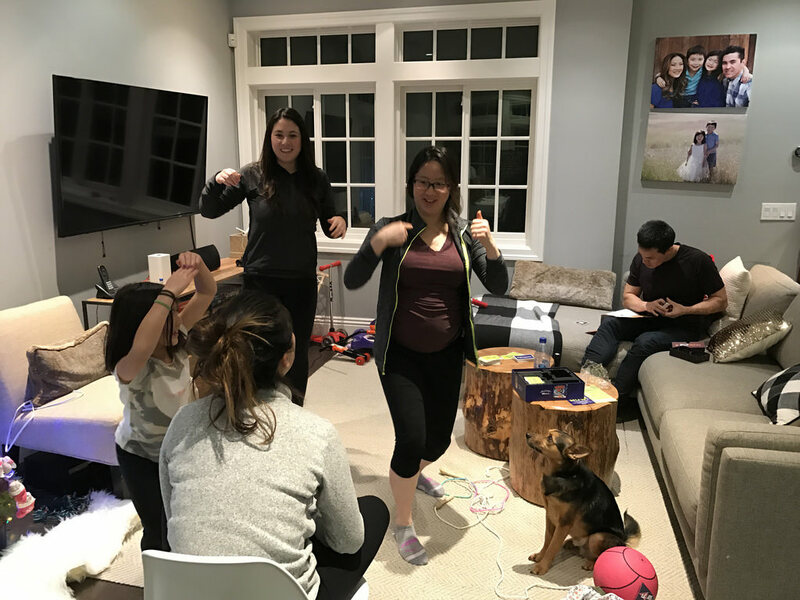 The lost in translation that happens with the typical telephone game is amplified by the fact that no one is speaking in charades as they try to pass the message along. 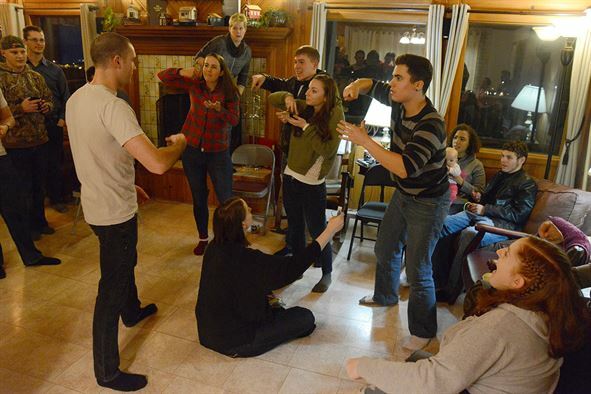 This version of Charades is similar to the last in that the word is passed from player to player by acting only, but this one is done in race-relay style. You have your teams evenly split. You will want at least 5 players per team and no more than 8 players per team. If you have 20 people, go with 4 teams of 5. If you have 18 go with 3 teams of 6. Two teams line up all facing one direction looking at the back of their team players’ head. The two opposing players on the end that can see the rest of the teams will start. They will both receive the word they will be acting out. 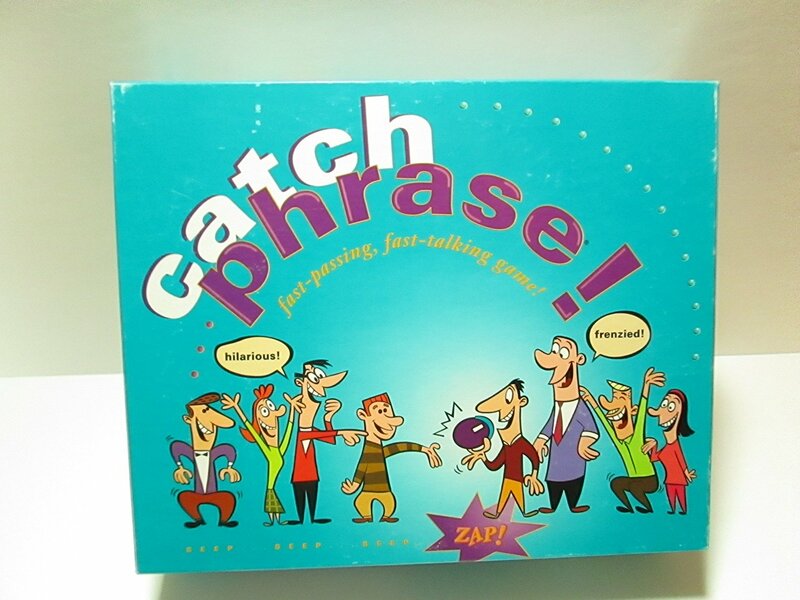 The race begins as both players tap the shoulder of the person in front of them then proceed to pass the word along. Once the receiving team member feels fairly confident about the word they can turn and tap the shoulder of the person in front of them passing it up the line. Players only turn around to receive the clue as their shoulders are tapped. It is a race and there should be an object to grab to determine which team finishes the race first. The team that finishes the race first gets first guess. If they guess correctly they get a point for the total number of players on the team. If they guess incorrectly it passes to the other team to guess. A correct guess will give them full points for all members on the team. If they fail then it goes to the next player on the opposing team to guess but now it’s minus 1 point. The guessing goes back and forth until the correct guess is given points reducing by 1 for each player that fails. There are no points awarded if neither team can guess it. Play this with an even set of rounds for each team you have. You may also have 3 lines going at the same time. Any way you play it, this the game is fun. The fast paced acting out is sure to gets some laughs. Some call this game Fish Bowl. This game is also sold as Monikers. It requires a big bowl and 3 or 4 slips of paper for every player. All players will need to write down Celebrity names on their papers. Fold the papers in half so that the name written is not visible and drop them in the bowl. Now divide into two teams. A minute timer will be needed. Play will then pass between teams as players step up and pull names from the bowl. The object is to get your team to guess as many celebrities as you can in 1 minute. As you empty the bowl, your team scores 1 point for each correct guess. Players may pass, but each pass will cost them a point. You may allow 1 or 2 free passes per player. Names passed are placed back into the bowl. Keep score after each player takes their turn. An opposing team player may also help younger children with reading or knowing who the celebrity is. This is played in 3 stages. At the end of each stage the names are all placed back into the bowl. Any remaining time at the end of a stage is given back to the team in play and they will begin the next stage with that time. Stage 1 is “Say Anything”. You can say as much as you like so long as you are giving clues and not saying the celebrity’s name, spelling it out, or rhyming it with. Stage 2 is “Acting Only”. You must act out only; no sounds, no sign language. Stage 3 is “One Word”. No acting or pointing. Simply draw the name and give a single word. Total up the points at the end of stage 3 and game over. This game passes one-minute at a time quickly. Competition can be fierce and celebrities everywhere will be offended. This game of wacky questions paired with random answers may create some lifelong inside jokes. Keeping an open mind for chaos and none sense is required to enjoy “What If…?”. Papers and pencils required. Write a “What if…” question. Throw the questions back into a hat and everyone draws. Make sure you get someone else’s question. On a spate paper, write an answer starting with “Then…”. Now re-distribute the answers. The game proceeds as players will now read their questions and then answer them by reading the random answer they pulled. Many questions will be left unanswered. But sometimes the questions and paired answers just make the perfect non-sense to get everyone laughing. Just a tip, but personalizing a question or an answer by using players names increases the likelihood of giggles. I mean “What if Uncle Bobbie really did turn into turkey?…”. 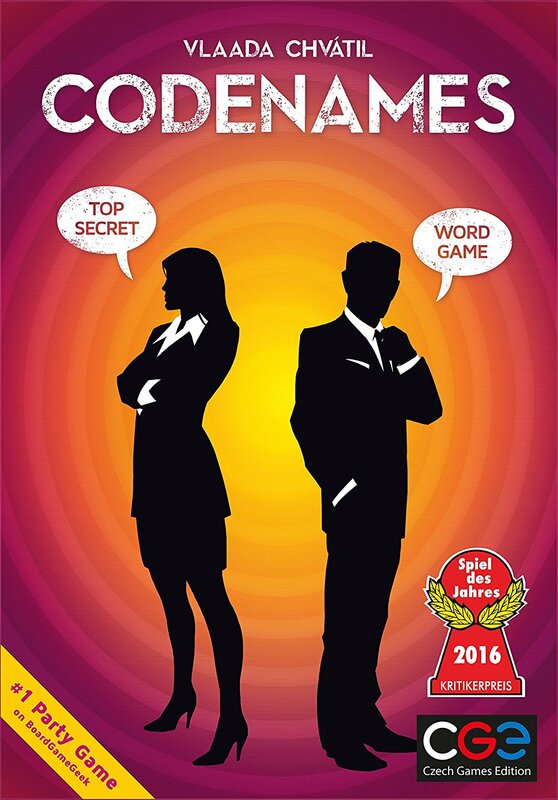 Topping my list of party size board games these days is Code Names. Best with at least 6 players. Clue giving word game at its finest. This game is a great get to know you game as players guess who gave what answer. Sold in a box, but playable without the official board game. Still, the box set moves play along rapidly and this game is a keeper. Keep your party alive and kicking with this fantastic board game. This game has taken on many forms from the free for all “Mafia” party game, to the more refined “The Resistance” game best as “Avalon”. In its many forms it will remain a party game for years to come. 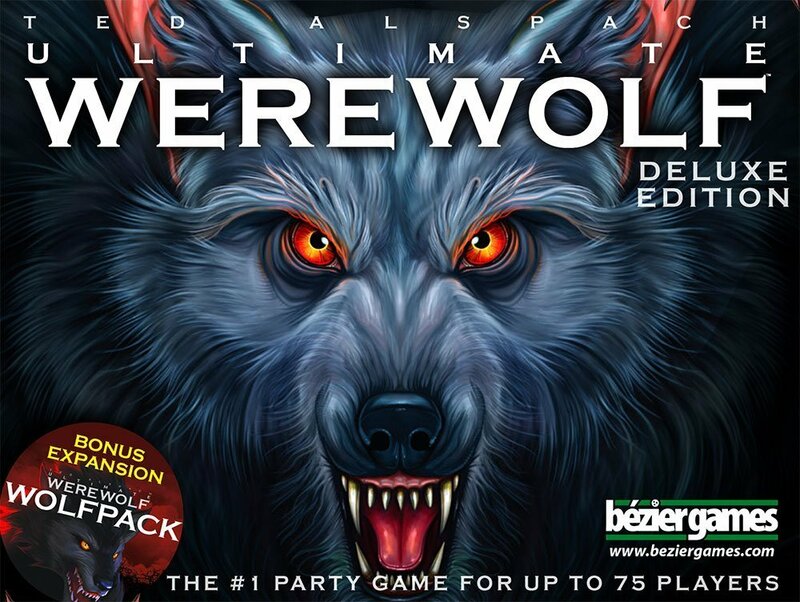 But I give you this version “One Night Ultimate Werewolf” as its best family and friend version. Absolutely playable for all ages. This box set plays each game in under 10 minutes. The app leaves no need for a game facilitator and makes it super easy for anyone to pick up and play. Who needs to read the rules when the app will walk you through? The best version of Pictionary ever invented. This is the telephone game but on paper and with drawings. Laugh it up as simple and easy ideas distort themselves into never before heard or seen fumblings. Guess the word, pass the ticking time bomb. Whatever team ends up stuck with the buzzer in their hands loses. This game can be too competitive and injuries may occur if the timer is thrown at players, but still worthy of our Top 5 Party Game list.